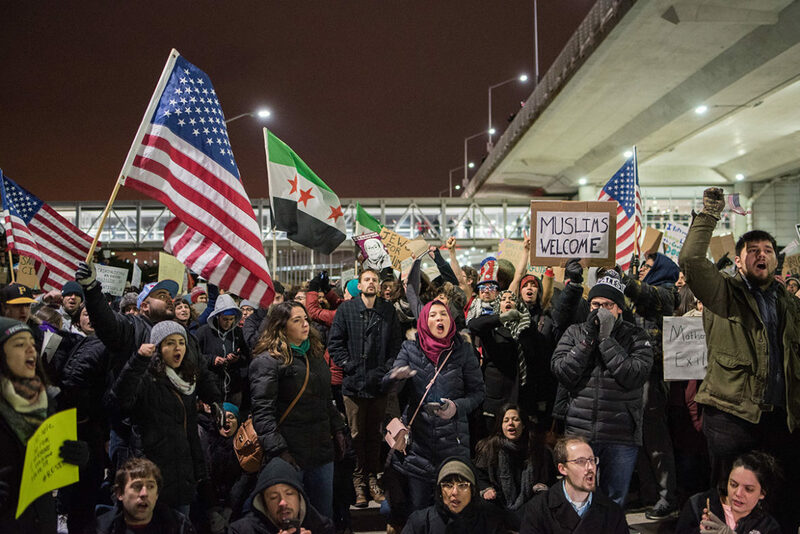 Protesters demanding the release of travelers detained due to the Trump administration’s travel ban against seven predominantly Muslim countries block traffic outside O’Hare International Airport on Jan. 28, 2017. The U.S. Supreme Court confirmed that President Donald Trump’s Muslim travel ban is constitutional. The 5-4 decision reversed a 9th Circuit Appeals court ruling and upheld the authority of the president to suspend the entry of non-citizens from five mostly Muslim countries (plus Venezuela and North Korea) if they are considered a threat to national security. Casting the president’s anti-Muslim sentiment aside, the court has granted Trump legal footing to advance xenophobia as a policy, under the pretense of making the nation safer. The Court’s majority deemed the administration’s justification for the travel ban acceptable. “The president lawfully exercised that discretion based on his findings — following a worldwide, multi-agency review — that entry of the covered aliens would be detrimental to the national interest,” Chief Justice John Roberts wrote in the opinion. Justices Sonia Sotomayor and Ruth Bader Ginsberg dissented, arguing that the ban, along with the flagrant anti-Muslim sentiment Trump expressed during his presidential campaign and while in office proved the policy to be discriminatory and based on hostility toward Muslim people. Trump’s travel ban started off as an executive order presented as an emergency measure to protect the country from terrorists. The January 2017 order ended up barring immigrants from coming to study or work from seven countries that have not been a source of terrorist attacks since 9/11. In February 2017 the Department of Homeland Security broadened the priority criteria for individuals eligible for deportation. In March 2017, the order was modified: a 90-day visa hold was applied to citizens from Libya, Iran, Somalia, Sudan, Syria, and Yemen, as well as a 120-day freeze on refugee admissions. Attorneys general from four states blocked the modification claiming it violated the Equal Protection Clause and the Establishment Clause of the Constitution. The ban is less about prohibiting the entry of Muslim nationals as a domestic safeguard and more about using immigration policy, like his family separation policy, as a weapon aimed at people of color. The Supreme Court’s ruling validates the administration’s own “fake news” that superficially justifies the need for a travel ban. Trump deceptively promoted it on the grounds that immigration law under previous administrations undermined national security, when in fact, just the opposite was true. The U.S. vetting process was one of the strongest in the world to begin with: the average screening process takes 18 to 24 months. Prospective immigrants are referred by the United Nations Refugee Service where in-depth interviews, home country reference checks, and biometric screenings are performed. The U.S. then performs its own intensive screening facilitated by nine different government agencies including the State Department, the FBI Terrorist Screening Center, the Department of Defense, and Department of Homeland Security. Military combatants are weeded out, and a DHS officer interviews every applicant, checking against criminal databases and prior visa applications. Iraqis, Iranians and Syrians are the most heavily documented refugees interviewed. For Syrians, only 50 percent of applicants are admitted. Of those admitted, 50 percent are children, 25 percent are over 60 years of age, and only 2 percent are of combat age. Since 2001, only 750,000 have been admitted and none have been arrested on domestic terrorist charges. Attorney General Jeff Sessions has long perceived the nation’s “browning” as a primary internal threat, comparing today to the early 20th century when waves of immigrants flooded the country. He said America’s 1924 immigration quota that completely barred Asians, restricted Italians, Jews, Africans and Middle Easterners while favoring northern European whites, was good for America. Trump and Sessions have expressed interest in curbing both illegal and legal immigration. Sessions has ties to anti-immigrant, anti-Muslim and white supremacist groups. The travel ban is as unnecessary as it is unjust. It was never about national security. Since 9/11, white supremacists and non-Muslim extremists have killed twice as many Americans as radical Muslims. The ban is less about prohibiting the entry of Muslim nationals as a domestic safeguard and more about using immigration policy, like his family separation policy, as a weapon aimed at people of color. Rep. Keith Ellison, D-Minn., a Muslim member of Congress, expressed dismay. The role the Court’s decision will play in the current crisis for undocumented families fleeing gang violence in Central America and seeking U.S. asylum, hangs in the balance. The litmus test of a just policy is the extent to which its values reflect moral imperatives. The travel ban fails miserably, as it’s an institutionalized rule of moral deception that sets a frightening precedent for the nation’s value system, and does nothing to make us safer. What we are seeing in real time is what happens when 40 percent of the nation’s electorate stays home on Election Day. Chicago’s Muslim population is estimated between 11 percent (300,000) and 18 percent (500,000) of the population. As the court’s travel ban and the announced retirement of Justice Anthony Kennedy, a long time “swing” vote on divisive issues, illustrates, it is just as vital to collectively object in the streets on protest days as it is imperative to collectively demand change at the ballot box on Election Day. The midterm elections are upon us. Your vote matters.